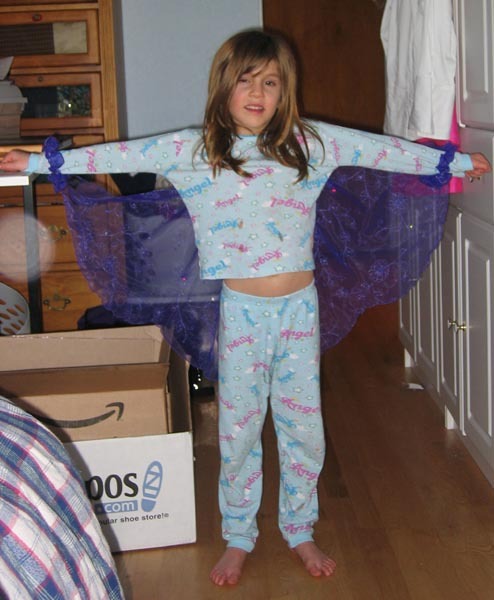 These wings are so easy. I’m so glad that I followed my gut instinct after reading Clemmie’s review. This really is a great book. It’s got all kinds of ideas for parties and costumes, and they are really easy to do, too! 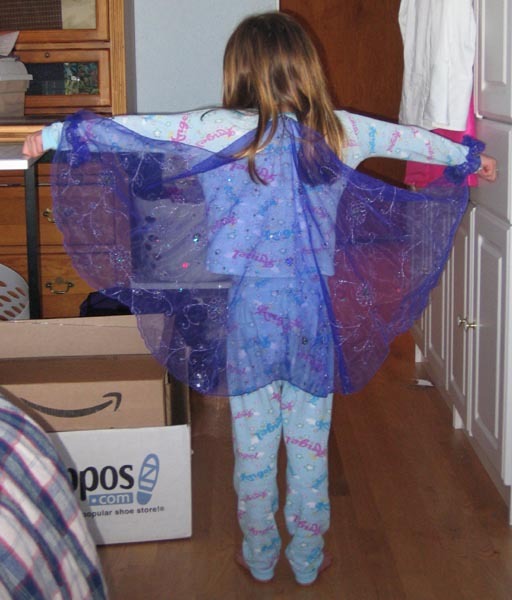 Pattern Review of the Fairy Wings Pattern Description: Very simple fairy wings. Pattern Sizing: One kid size, but it would be very easy to alter this for an adult or baby. I didn’t really follow the instructions. However, I do remember them telling you to trace the pattern piece. DISLIKE: It didn’t call for any interfacing, and the sheer fabric we used was not strong enough when Pulgito grabbed it. It ripped away from the scunchies that held it to DD’s wrists. I think that would be frustrating for a non coutiere. Fabric Used: Some sheer from Joann’s. I added interfacing at the snap (before Pulgito attacked) and where the scunchies attach at the wrists. The pattern called for velcro straps at the wrists, and I changed that to the scunchies. It’s cleaner and easier for the kids. I used snaps to attach it to the costume dress, but for the pictures here, I used a safety pin. I hope to be reviewing other things from this book. Thanks, Clemmie! Conclusion This is a really, really great book. If you’ve got kids, grandkids, babysit, or do daycare, this book is just wonderful. « No, You Can't Climb That Tree! Pingback: Acorns to Oaktrees » Blog Archive » Flower Fairy Dress Fixed!